Thank you for writing and posting these. They are great! So excited to use these in my data folders. Thanks for the help. MUCH APPRECIATED!! Do you have common core in Spanish? Landa, sorry, we don’t have any resources in Spanish yet. Will you do common core for pre-k also when it comes out? Hi! Yes, we will do I Can for pre-k. We will most likely post it on our family web site where we are going to be building up our preschool curriculum over the summer. You will find it at http://www.thecurriculumcornerfamily.com. We currently have these checklists for teachers of young children…http://www.thecurriculumcornerfamily.com/2012/11/04/early-childhood-develpmental-goals-checklist/. Thank you so much for these great forms. I was wondering if you had any for Pre-K? Hi! We do not yet have forms for pre-k. We are hoping to complete them this summer. Once completed, they will be found on http://www.thecurriculumcornerfamily.com. Thanks! This is such a great resource! I love the format and family friendly print. The clip art is perfect too. I plan on creating a color coded packet for each of my students. Thanks again. I am planning on using these as posters in my classroom (3rd grade teacher-Cindy’s idea). I am going to put a green sticker on “I can” statements we work on, then a gold star when we master it. Great visual for me as well as the students who can look at all the stars and see all the things they “can” do! This is SUCH a timesaver! Thank you for the freebie!! I “LOVE” the “I Can” Common Core Checklist! What a wonderful idea to simplify and see what is needed…for teachers, students, AND parents! Thank you!!! Thank you for your wonderful, informative, and helpful site. We are just starting homeschooling and this site has been so much help as I build a homeschooling common core curriculum. I really cannot thank you enough. Thank you for the free information. This will be very beneficial to me since I was just assigned to work Kindergarten this year. HIGH FIVE!!!! Thank you so much for these wonderful worksheets! I am so broke right now, and I needed something for CCS. I can’t thank you enough for your generosity! Jill & Kathy – Thank you so very much for this resources. You have made our lives a little bit easier by not having to stress over having one more thing to do. I truly appreciate your time and effort. Thank you so much for these resources! They’re just what I’ve been looking for! Thank you so much for making these! They are much easier for everyone to follow!!! Thank you so much for all these wonderful checklists and posters. These will definitely help me with management. I will share your site with the other teachers at my school. Thank you so much! These statements are very user friendly. Do you happen to have them typed up individually where I can post one at a time? If so, please direct me where I can find them. This has been an invaluable to while I have been planning. A big thank you for the “I Can” common core statements. This has been such a timesaver and very kid friendly especially for kindergarten. 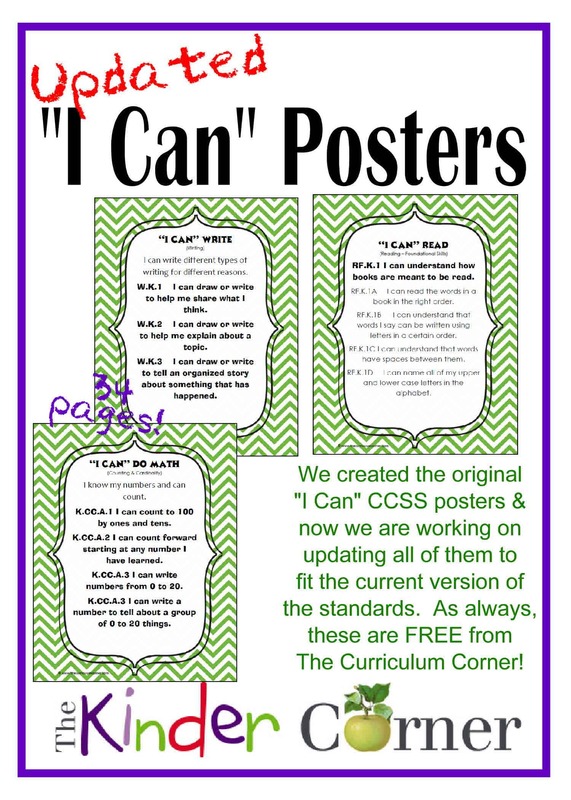 Will you be doing common core in the poster format for kindergarten? We so appreciate all your time, talent and effort. We’re glad you like them! We will be completing the posters for grades K – 6. Look for kindergarten to be shared next week. These are perfect for helping us put the Core into “kid friendly” language, as well as something that can be shared with parents. Thank you! Wow! This website is a treasure trove for teachers struggling with how to manage artifacts for teacher evaluation, recording CCSS presentation, reteaching, student growth, and achievement . Thanks for sharing all your diligent work and making this latest change in education easier. Thank you for this breakdown of Common Core Standards! My second child is entering Kindergarten this coming year and this really helps me understand what is expected and will be taught much better! Thank you again.